A duplicated palette is a simple copy of the original palette. 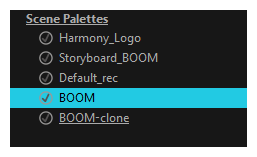 When you duplicate a palette, the duplicated palette will have the same colour names and values, but will have different colour IDs so that Harmony does not mix it up with its original palette. This is useful when you want to create different palettes for similar models, but want to avoid having to create the palette and its colours all over again. You can just start with your duplicate palette, tweak the colours and add and remove colours as needed. In the Colour view, select a palette to duplicate. Do one of the following: From the Colour menu, select Palettes > Duplicateor right-click and select Duplicate. Right-click on the palette and select Duplicate. Open the Colour menu , then select select Palettes > Duplicate. In the New Palette Name field, enter the name for the new palette. 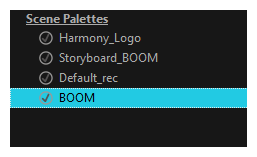 By default, the palette's name is based on the original palette name followed by "-copy". The palette list above this field lists the palettes that already exist in the selected location. Make sure you enter a name that is not already used by another palette. The duplicated palette appears in the palette list.